Melt two-thirds of the butter in a pot over medium-low heat. Stir in flour, then add white wine, vegetable broth, and heavy cream and whisk to combine. Season with salt, pepper, nutmeg, and sugar to taste. Let simmer over medium heat for approx. 5 min. while whisking. Peel and finely chop garlic and onions. Melt remaining butter in a large pot over medium heat and fry garlic and onions for approx. 2 min. Add frozen spinach and let simmer until the spinach is defrosted and soft. Season with salt, pepper, nutmeg, and sugar to taste. Preheat oven to 180°C/355°F. To assemble the lasagna add a layer of noodles to the casserole dish. 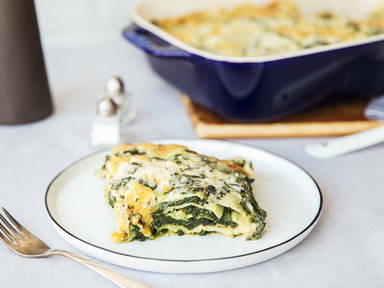 Top with a layer of spinach filling, and a layer béchamel sauce, then sprinkle some pine nuts on top. Repeat pattern until casserole dish is filled. Finish with a layer of béchamel sauce and remaining pine nuts. Sprinkle with Pecorino cheese and bake in the oven for approx. 30 – 35 min. or until the top is golden brown. Remove from the oven and let sit for approx. 10 min. before serving. Enjoy!